So today was lovebug’s One Year check-up and after four shots at the pediatrician we ended up home with lots of snuggles and a very long nap…and I napped too (30 peaceful minutes v. his 3 hours!). However, I didn’t intend to be home today, but helpful hubby scheduled the appointment not realizing that 1. He forgot which day and 2. It was at 10:30am – since I’m already 30 minutes away from my job I pretty much can scratch my day after being done close to noon… So we ended up home. Honestly I didn’t realize I needed it, but I guess I did. Though I had grand plans of doing a ton of things, the internet was down in our area (really?). So I actually did rest, worked on some new ideas for the shop and even created goals for the shop, this blog, and my life! Who knew it would turn so productive?!?! 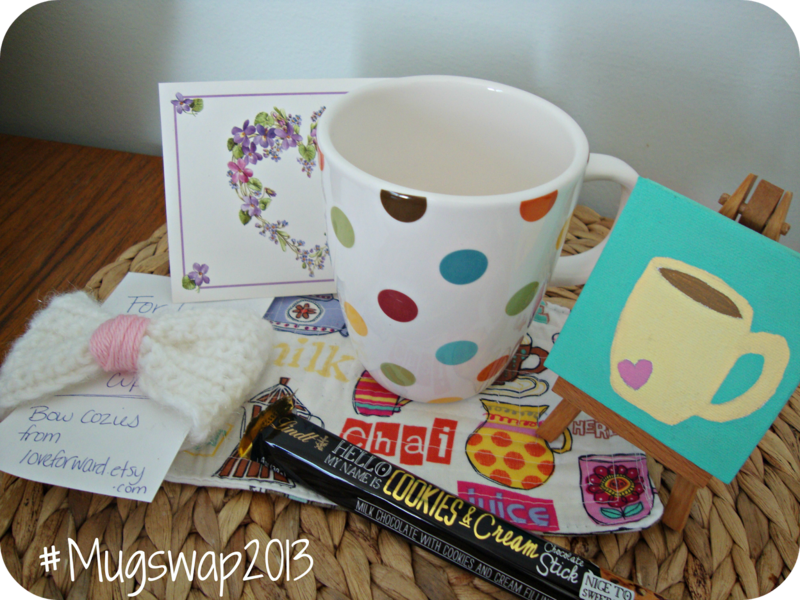 This was my first ever swap to sign up for and I LOVED IT!! I really enjoyed sending out something to my partner and just having fun with it. From the mug to the painting to the chocolate (which I happily ate during nap time) I felt so special and really loved what I received. Ever get something and not really like it…well this didn’t happen today! I’ve already found a place for my painting and I’ve had 2 cups of coffee from my mug. So we can pretty much say this was a total WIN. I liked this experience so much I’m getting ready to host a swap of my own with another lovely Instagram handmade shop owner! Stay tuned for details.